NASA has released its highest-resolution color image of Pluto, showing the dwarf planet dramatically backlit by the sun. The receding crescent was snapped by the New Horizon Spacecraft as it traveled some 120,000 miles (200,000 km) from Pluto. Somewhat confusingly, the space agency dubbed the photo as a “Farewell to Pluto” because the shot was captured during New Horizons’ departure from the planet, and not because Pluto or the spacecraft are going anywhere. The image, described by NASA as being “shown in approximate true colour”, is constructed from six black-and-white images taken by the Long Range Reconnaissance Imager (LORRI) and one color image from the lower-res Ralph/Multispectral Visible Imaging Camera (MVIC). All photos were taken about three and a half hours after New Horizons made its closest approach to Pluto on July 14, 2015. 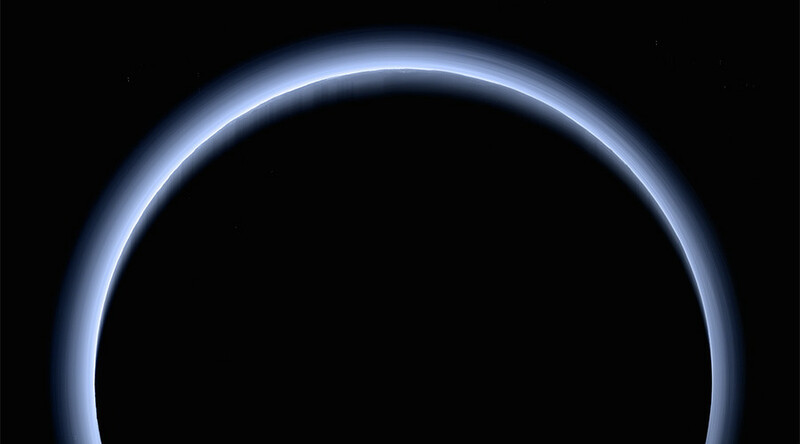 The image showcases Pluto’s spectacular blue haze atmosphere — a photochemical smog composed of a mixture of methane and other molecules as it was illuminated from behind by the sun. The layers of haze extend to altitudes of over 200 kilometers (120 miles) from Pluto’s surface.